Knowledge of the surface chemistry and surface structure is essential in the design, production, and application of a catalytic material. 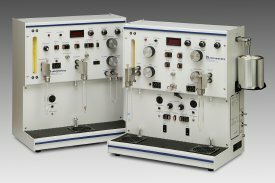 The Micromeritics ChemiSorb Series analyzers combine the ability to perform both physical adsorption and chemisorption measurements in a low-cost and upgradeable system. The basic ChemiSorb 2720 makes chemisorption (percent dispersion, active metal area, crystallite size, and surface acidity) and physisorption (single-point BET surface area, Langmuir surface area, and total pore volume) analyses affordable for even the most modestly funded laboratories such as teaching and research applications where owning an instrument had once been impractical. The instrument features dual ports, one for analysis and one for sample preparation. Standard features include a built-in sample cell cooling fan, four carrier gas inlets, a preparation gas inlet, and the optional capability to accommodate a mass spectrometer or other external detector. If analytical needs grow, the basic system can be upgraded to provide more capability. The ChemiSorb 2750 allows the same analyses as the ChemiSorb 2720 with the added advantages of higher precision, faster throughput, and more convenience in accommodating a variety of experiments. Possible contamination of a prepared sample by exposure to the atmosphere is eliminated by dual-function sample ports that can either be used as a sample analysis port or degas port. The instrument includes an injector loop valve in addition to the injection septum; loops are easily exchangeable to provide different injection volumes. Three built-in preparation gas inlets and four carrier gas inlets are included. An optional ChemiSoft TPx System (temperature-programmed controller and software) expands the capability of the ChemiSorb 2720 or 2750 to include: multipoint BET surface area, temperature-programmed reactions, data archiving, and advanced data reduction and reporting options.